Prestige hotel is a restored 400 year-old house that keeps the spirit and the charm of the Revival period with its typical architecture. It is a cultural monument of national importance. It is a two-storeyed house with stone foundations and a joint terrace. 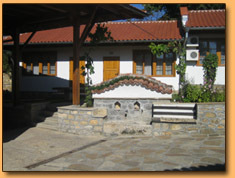 Prestige hotel is situated near to the Konstantzalieva house, a historical museum, in the center of the village of Arbanassi. All rooms are furnished in a modern style, with a bathroom and a toilet of their own. They have a heating installation, air-conditioners and TV sets with cable television. The hotel can accommodate 22 - 25 guests. You will find peace and calm in the indoor tavern which has at its disposal 40 seats. Here you could enjoy the cosy atmosphere of the burning fireplace. There is a summer terrace and a penthouse with barbecue seating 40 persons. We offer delicious home-made specialities and an incredible choice of different brand drinks. The lovely atmosphere and the professional service will make your stay an unforgettable experience.